Babies are the most adorable thing ever. They melt your heart and bring a smile to your face almost effortlessly. They’re also very delicate and fragile. They’re so precious you want to keep a close watch on them and never want to leave their side. However, as much as you’d like to guard them 24/7, watching your baby isn’t the only thing that you need to do – especially if you have other children who need your attention. There is absolutely no way you can be productive if you just keep watching your baby, who will probably be asleep most of the time anyway. Good thing there’s a tool you can use to help you keep watch with your baby even as you perform other tasks that need to be done; and it’s called a baby monitor. Baby monitors are designed to make your life a lot easier. It is an essential tool that brings you peace of mind. With its help, you can check on your baby even when you’re in the next room or running around the house trying to do other things. Some of the latest baby monitor models even have extra features that let you play songs remotely so you can send your baby back to sleep. One of these products that has these advanced features is the Infant Optics Dxr-8. The Infant Optics Dxr-8 is a very remarkable product and it has earned positive feedback in different product review sites. One of its highlighted features is its ability to hook up as many as four cameras into its parent unit. This add-on camera unit is designed for that purpose. The Infant Optics Dxr-8 is dominating the industry of childproofing devices with its advanced features that make it a very reliable baby monitor unit. It sports the most cutting edge technology when it comes to transmitting clear and crisp images and sound. Its 2.4GHz Wireless transmission offers delay-free video streaming from its camera which makes use of an interchangeable lens technology. What makes it a lot more interesting than other baby monitors is its ability to hook as many as four cameras to maximize the scope or the area that it covers. This add-on camera designed to be compatible with the Infant Optics Dxr-8’s pan and tilt feature is exactly what you need to keep your baby as secure and comfortable as you want them to be while you are doing other tasks. The camera allows a 270-degree rotation and you can tilt it to as much as 120 degrees. This gives you the ability to adjust the camera and check the whole room instead of just fixing it to your baby’s crib. It’s equipped with night vision properties, allowing you to adjust the brightness in dimmer lighting conditions. The Infant Optics Dxr-8 has a lot of excellent features and these add-on cameras are designed to support such features. However, as impressive as its ability to capture really clear images even in poor lighting conditions, the camera doesn’t come with a highly sensitive microphone and it can only capture loud sounds. Considering all of the advanced features that it has, the Infant Optics Dxr-8 is nothing short of impressive. 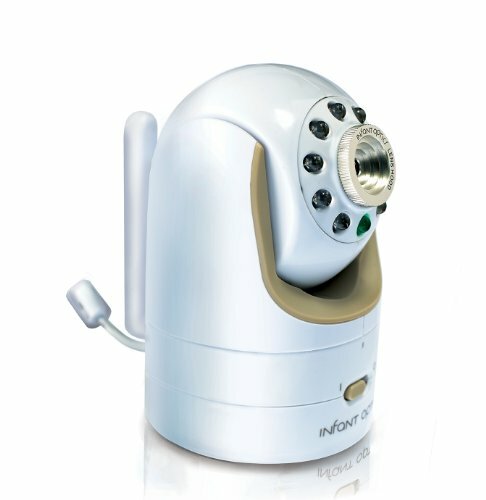 It is one of the most versatile baby monitor products you can find in the market. The best things about it is its ability to accommodate multiple cameras. This add-on camera is specifically designed for the Infant Optics Dxr-8’s features. You can strategically place additional cameras in your baby’s room or other rooms and take advantage of the unit’s extended range. It may be a little more expensive than the average baby monitor unit but worth it as your baby’s safety is priceless. The Infant Optics Dxr-8 is a very promising child security gadget. It offers a lot of features that an average baby monitor unit doesn’t have. It’s the reason why it is considered a best seller just like the Minilabo video baby monitor. Both are great units and have the ability to hook multiple cameras but the DXR-8’s image quality is better than the Minilabo’s.